The Heritage Wood Cremation Urn is hand crafted through a labor intensive process, using solid cherry and walnut wood. 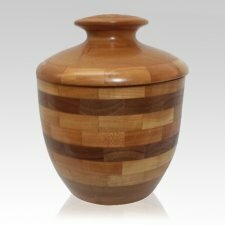 This urn features a cherry wood body, which is accented with two bands of walnut wood. The urn is made by assembling separate pieces of wood into the basic shape of the urn, and once dried, the urn is refined by hand on a lathe. The pattern of the wooden tiles, combined with the natural pattern in the wood creates a truly stunning effect. Because of the natural material and that the urn is hand-made, no two wood urns will ever be identical, and slight variations in the color and size are to be expected. This urn will be a truly one of a kind and unique tribute to your loved one.